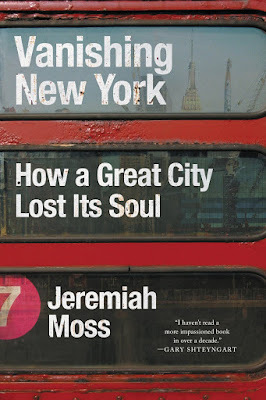 Today marks the fifty-sixth week of my Tuesday's Truths series and I'd like to dedicate this entry as a follow-up to yesterday's post re Anel Cleaners, which has been a fixture on NYC's Upper Westside long before Lincoln Center opened in the 1960's. Anel shut down in April of 2016. Leo Saltzman's (the dearly departed sole proprietor of Anel) daughter, Robin, whom I've known for many years told me that the closing of Anel had nothing to do with rent increases as "her father bought the building years ago." Ms. Saltzman has now rented the space that was known as Anel to Aēsop (an Australian cosmetic brand). 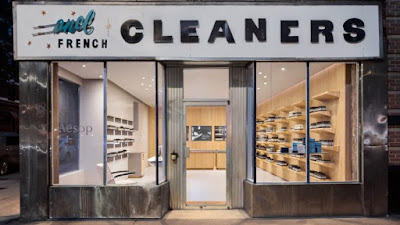 According to an article titled Tacklebox creates Aēsop Upper West Side in former dry cleaners, which is written by Dan Howarth, "Having made the choice to retire, she (Robin Saltzman) hand-picked Aēsop to reimagine their (Anel's) space." The result of the new storefront can be seen in the set of photograph posted directly atop this blog post. This image is from the aforementioned article. 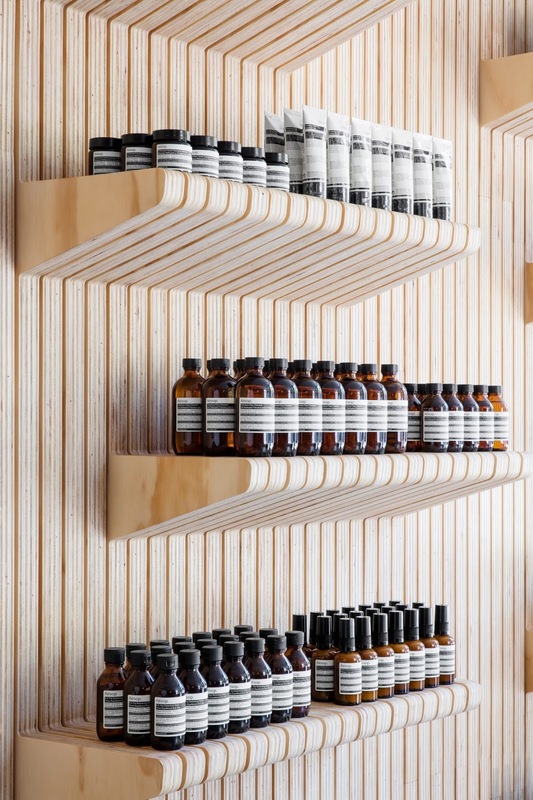 Howarth explains that "A dry cleaners (Anel) on Manhattan's Upper West Side has been converted into a store for cosmetics brand Aesop, for which Tacklebox Architecture has created display shelves with profiles of upside-down clothes hangers." The following image is from Howarth's article and "illustrates" the display-shelf accomplishment of Tacklebox Architecture. Horwarth goes on to explain that "The facade and signage of the local landmark was preserved, while the interior of the 700-square-foot (65-square-metre) shop was overhauled to create a minimal aesthetic. Two of the walls are lined with vertical strips of milled pine plywood, oriented so the layers are visible." 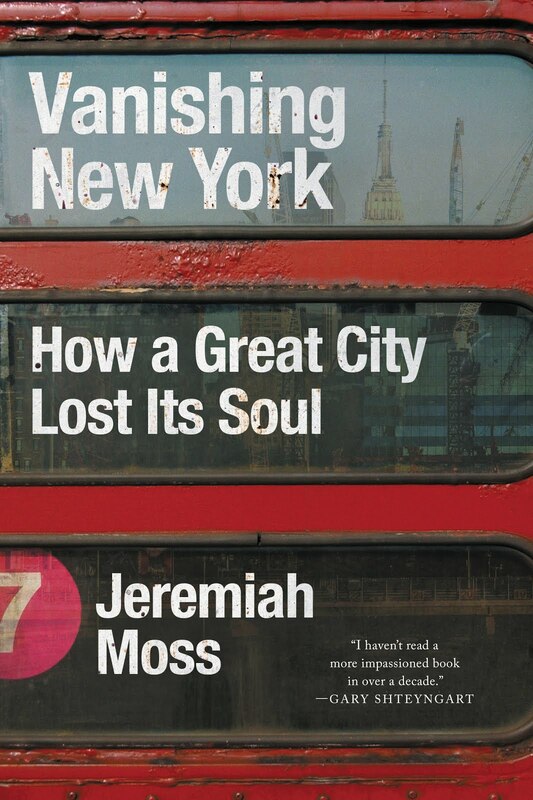 An image of the latter "renovation" can be seen directly below and is also included in Horwarth's piece. 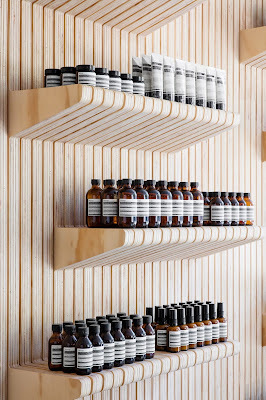 "Shelves for displaying Aēsop's distinctively branded products that protrude from the wooden wall take the shape of upturned clothes hangers – "a subtle gesture referencing the former life of the building. The pine is also used to clad the service counter at the back of the room and a small cabinet close by." Horwarth makes other points in his article before concluding with the designer's goal for Anel turned Aēsop: "Extending the legacy of Anel, it offers a fresh space for the ritual of personal maintenance, restoration and renewal." It's a nice thought. I'm not sure if I can visualize Leo Saltzman or his longtime worker, Audrey, in this quasi-Anel; but I certainly give the designers credit for making it a goal to preserve what has been in the making of the new. feels about this well-intended compromise?